Home Stock & Shares Are Your Investments At Risk As Markets Tumble on Turkey Crisis? Are Your Investments At Risk As Markets Tumble on Turkey Crisis? The crisis in Turkey’s financial markets has been rumbling on for some time now but until Friday wider international markets were taking events in their stride and refusing to panic. However, following the Turkish lira’s 20% crash on Friday, a new record low against the U.S dollar, concern that the situation could spill over into other emerging markets and even the euro began to bubble to the surface. On Monday morning the lira dropped again, by almost 6%, and fears of contagion are now rattling markets. If you are investing online into an ISA, SIPP or general stock trading account should you now begin to worry and should you be doing anything to protect your investment portfolio? What exactly is going on in Turkey, why is it now spilling over and is the current situation likely to escalate in a way that could have a lasting impact on the value of your investments? Turkey has seen a recent construction boom and the large sector borrowed heavily to finance projects. Strong man president Recep Tayyip Erdoğan, who many feel is taking Turkey away from its modern history of secular politics towards a greater Islamic influence, has regularly taken his own direction on geo-politics. This has led to a deterioration of international relations, particularly with the USA. The recent spat caused by the detention of an American Christian pastor hasn’t helped. Combined with a weakening lira making Turkish exports cheaper and the Erdogan administration’s failure to slow rampant inflation, even bizarrely lowering interest rates, the response of President Trump has been to single Turkey out for particularly punitive new trade tariffs on exports to the U.S. 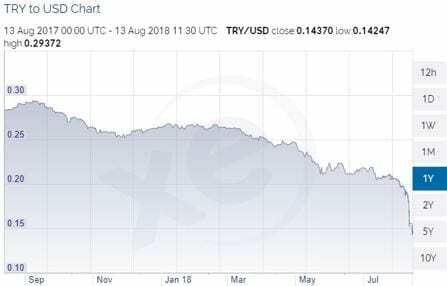 The result of this was economic tremors that have descended into the current lira crash. It has become a vicious circle of the weakening lira causing concern Turkey’s highly leveraged construction sector might struggle to meet its dollar-denominated debts, which have become more expensive to service. Around 40% of all debt in Turkey is held in major foreign currencies against which the lira has now dropped around 50% against over the course of 2018. This led to a flight of capital from the lira, fuelling the downward spiral. As this week began the crisis has infected other emerging market currencies with the South African rand dropping by 8.2% at one point before bouncing back to 2.9% down on its open. The Mexican peso also slid 2%. The JP Morgan index for emerging market currencies is at a new all-time low, the first set in three years. Will The Turkey Crisis Prove Contagious? There are concerns the euro, which this morning slid against the Swiss franc, could also be infected over concerns of the exposure European banks have to the Turkish economy. European markets have been gloomy this morning and the FTSE 100 is down over half a percent. How likely is it that UK investors will feel any notable impact? There are three ways an economic crash in another country could hit UK investment portfolios. The first is how much Turkey buys from the rest of the world. Despite being a large country with a population of nearly 80 million, Turkish GDP makes up less than 1% of the world’s total. With emerging market growth already priced into financial markets as entering a slow period, this is unlikely to have a significant impact. Contagion across the international banking sector is the next danger if banks have lent to Turkish businesses or own Turkish banks as subsidiaries. This does worry the ECB and is what has prompted a sell-down of equity in European banks. However, worries around the European banking sector are not new and this latest development has only slightly heightened that. At least for now it is not thought that European banks are exposed to Turkey at a level that could place them in serious trouble. Will The Emerging Market Crisis Deepen? The final, and biggest, worry is financial markets contagion. Losses taken by institutional investment portfolios need to be compensated by profits being taken elsewhere. If too many investors pull capital from funds this can force managers to sell off and lock in losses. Emerging markets have already had a poor year and there is a danger that the Turkey situation could lead to a run on EM funds. Adding to this likelihood is the heavy losses China’s stock market has taken this year. The hope for the wider emerging markets investment class is that they look attractive after a dip this year, now deepening, and capital moves to buy this dip, avoiding any deepening of the current crisis. However, a danger that increases the risk of this scenario unfolding is the continued strengthening of the dollar. That could contribute towards attracting capital away from emerging markets that might otherwise have seen an opportunity there. The dollar’s strength is likely to prove to be the deciding factor on whether this crisis develops into a deeper one. If it maintains its recent upward trend, that is likely to spell bad news for emerging markets. The upshot is that if you are investing online the main danger, at least in the short to medium term, is if you have significant exposure to emerging markets. On the flip side U.S. and, to a lesser extent, other developed markets like the UK will likely benefit so if your investment portfolio has strong U.S. exposure, and to other developed markets such as the UK, the negative impact is likely to be minimal with potential upside. Why Invest in Emerging Markets In The First Place? Emerging markets funds and indices are most popular with investors who are not in a late stage of their investment cycle. While more volatile than the financial markets of developed regions such as the UK, Europe and the U.S., the economies of emerging markets are, coming from a lower base, growing much more quickly. Their economic growth is expected to be the engine of the world’s economy for the foreseeable future and already accounts for 60% of it. Emerging Markets suffered a decline between 2013 and 2015 but bounced back strongly over the following two years. 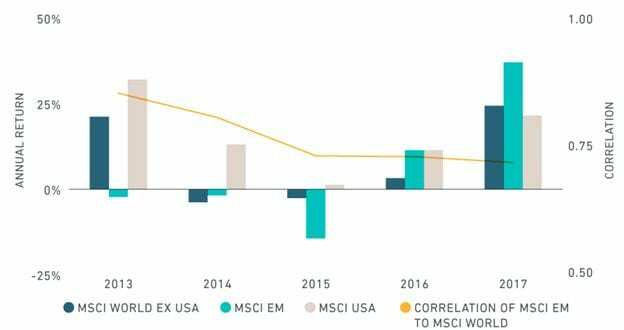 In 2017, the MSCI Emerging Markets Index returned 38% compared to 23% from the MSCI World Index. The FTSE 100 returned 7.9% in 2017 and even the S&P 500, which had a blockbuster 2017, was way behind with a full year return of 21.14%. Strengthening EM currencies delivered a significant chunk of those returns. The opposite has been true in 2018 as a strengthening dollar, as well as capital moving away from higher risk asset classes in anticipation of the end of the decade-long bull cycle in equities markets, has hit emerging markets. 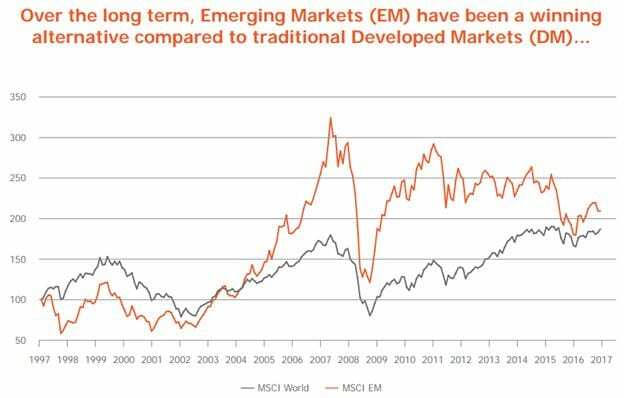 However, despite the volatility, since 2005, the EM index has outperformed the developed world. As FMG Funds notes, EM markets are currently at a ‘fascinating juncture’. The BRICs economies (Brazil, Russia, India and China) contribute 22% of global GDP but only 13% of global equities’ total market capitalisation. As markets become more international that gap should close, with EM investors profiting. EM equities also have much cheaper valuations compared to developed market peers as well as paying higher dividend yields and earnings growth. This dislocation is believed by many EM bulls to present a unique middle to long term opportunity. Should I Make Adjustments to My Investment Portfolio to Protect Against an EM Crisis? There is no definitive answer to this question for more than one reason. The first and most obvious is that at the moment no one knows to what extent the Turkey crisis will spill over into the wider EM asset class and if it does for how long. However, there is certainly a risk that it will and that the impact could be more significant than expected as recently as last week. The trade-off of higher volatility to the prospect of higher returns that characterises emerging markets means that it is generally advisable to increase EM exposure earlier in an investment portfolio’s lifespan and gradually reduce it the closer to retirement, or other intended use, the investor gets. If you are approaching retirement, or already retired, and plan to cash in on investments, you don’t have as much of the luxury of time to wait for emerging market investments to bounce back from any major downturn. In this scenario you should, however, already have relatively limited exposure to EM and have repositioned into less volatile asset classes. If you haven’t done so and will need to sell off EM assets within the next months or even year or two, there could be a case for cutting losses now. However, only to the extent of raising cash that will be needed short term. Investors with a longer term outlook shouldn’t panic. Emerging markets will bounce back and in the longer term will be expected to again outperform more mature developed markets that are higher valued and lack the same growth potential. Not having kneejerk reactions to turbulent markets is a general rule of successful long term investing. It’s also the reason that even when it comes to less volatile asset classes like developed markets, any cash requirements for the coming five years should be held in either cash or bonds. This will mean that if your investment portfolio does suffer from a loss of value you won’t have to crystalise that loss by selling. As long as you are invested in high quality, diversified equities and other asset classes, regardless of whether they are based in developed or emerging markets, they should always bounce back if you are able to wait up to five years. Have a review of your investment portfolio and if you are confident that any exposure you have to EM is generally strong regardless of temporary turbulence, sit tight. The tide will turn and you should benefit from the faster growth EM is contributing to the world economy than the developed world.